There have been various debates and increasing questioning of the link between alcohol and skin problems, more specifically acne. There are some undergoing research and general factors which signal towards the adverse impact that alcohol may have on your skin. This article shall discuss why and how alcohol may damage your health, specifically your skin resulting in severe acne breakouts. How does Alcohol Harm your Health? Alcohol has been known to mess with your health, particularly your mental health, in a lot of many ways. One major problem is that regular consumption of alcohol can lead to disruption in the functioning of your brain. It can hinder communication with the body leading to serious neural issues. Indulging in regular consumption can also cause heart problems like cardiac arrest and cardiomyopathy along with problems of high blood pressure. However contrary to this fact, there is another one according to which a bit of consumption, in moderate quantity always tends to benefit. Alcohol may cause fat to accumulate on the liver, hindering the supply of nutrient and oxygen to the liver. While these are the major health problems associated with alcohol indulgence, there are other issues as well, though the cases of such are relatively rare. It leads to the weakening of the immune system which is thus not able to fight diseases efficiently. In extremely severe and rare cases, it has also been known to cause throat, liver or mouth cancer. There has been not one but many ways, both major and minor, in which the consumption of alcohol has negatively been linked to acne breakouts. One of the major causes that have been very frequently established is that if we drink on a regular basis, the alcohol tends to weaken our immune system which thus becomes incapable of fighting the acne-causing bacteria strongly and leads to regular accumulation and activity of the bacteria. The immune system thus is unable to keep the bacterial activity under control which causes a build-up of these bacteria. Another primary cause of acne breakout is the rise in the level of androgen hormone which stimulates the sebaceous glands to cause excessive production of sebum. Consumption of alcohol affects an imbalance or rather rise in the level of testosterone and androgen in both men and women. This happens because when you drink any form of alcohol, your body tries to convert the carbohydrate in your drinks. When there is excessive consumption and with speed, your body might not be able to convert the carbs with the same speed as you are consuming the alcohol. This causes an imbalance in the body which leads to the rise of hormones or more specifically testosterone and androgen. Another major problem that regular consumption of alcohol leads to is that of liver damage which in turn serves to increase the severity and frequency of acne breakouts, among various other health problems. Alcohol is a hepatoxin which means that it specifically causes damage to the liver by destroying cells that detoxify our body. The liver is involved in maintaining the health of the skin in various ways. Firstly, regulates hormonal balance in our body; secondly, it helps in maintaining the blood sugar level in our body, an imbalance in which also causes ace flare-ups, and most importantly, it works towards flushing away the toxins from our body. Due to liver damage, our body is automatically crippled in performing these activities and has an adverse impact on the skin, therefore. The consumption of alcohol can cause deposition of fat on the liver which will stop the blood supply to the liver cells. This tends to stop the supply of nutrients and oxygen to the liver which therefore gets damaged and is unable to maintain the health of the skin. Furthermore, drinking activities are frequently associated with the problem of stress. This means that people tend to indulge in drinking mostly when they are stressed out. This causes an added disadvantage because stress in itself has been known to; if not cause then in the least, alleviate these breakouts. The stress relieving hormones released by our body, namely adrenaline, and cortisol, tends to affect an increased level of testosterone and androgen in our body, which is the primary cause of acne break out. Also, stress causes the lining of the skin pores to break which results in inflammation and redness of the skin, causing the pimples to come out on the surface. It further acts as a catalyst for cells that are involved in the production of sebum and at the same time works towards weakening the immune system. It has also been established that cortisol tends to cause a thickening of the lining of the hair follicles which facilitate blocking of the skin pores. Alcohol further affects the overgrowth of candida which is a kind of fungi present in yeast and sugary products, specifically cocktails, beer and other kinds of mixed drinks. The overgrowth of this fungus can lead to breakouts on the skin though medically speaking these are not acne breakouts, they are of the same kind. One important way in which alcohol consumption affects the kin is through dehydration. It causes the water content of our body to lower down. The presence of a sufficient amount of water is necessary to flush out the inflammatory toxins from our body, the inability of which will cause inflammation that will lead to aggravation of acne breakouts. Furthermore, dehydration causes the shrinkage of skin pores which helps or rather facilitates the clogging of these pores. Moreover, alcohol consumption causes a widening of the blood vessels which tends to make the skin red or flushed. This phenomenon is known as a vasodilator. The occurrence of this also leads to inflammation which causes the pimples under the skin surface to come onto the outer surface. Alcoholic drinks also contain sugar will lead to inflammation at the cellular level and often results in acne breakouts. It also tends to lower down the Vitamin A content in our body. Vitamin A is extremely important and effective to maintain the health of our skin specifically. Very often Vitamin A supplements and herbal medicines are prescribed to people who have long suffered from acne and other skin problems. Thus its lack is a severe shortcoming. Congeners is another component of alcohol that is formed during the process of fermentation and is largely responsible for the taste and smell of it. It is this substance that is responsible for the hangovers that people have. The more hangover people have, the duller and prone to damage their skin becomes. There may be included two other minor ways in which alcohol can increase the probability of these breakouts. Firstly, indulgence in alcohol consumption may lead to ignorance of your regular and routine regimen. This sort of disruption of the regular routine can often cause the reoccurrence of acne flare-ups. Secondly, alcohol tends to hamper our motor skill and we are at times not able to control ourselves completely. At such a time it is really important to make sure that we do not engage in irritating our skin as it may potentially lead to breakouts. 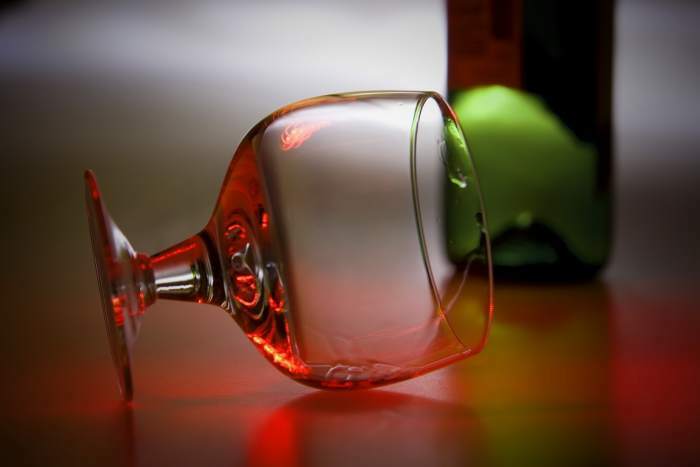 Though alcohol consumption in moderation has been justified and even suggested by various medical professionals, overindulgence might cause severe health issues. Not only does it have an adverse impact on your health in general but also works in various ways to undo the natural beauty of your skin and cause damage. It is, therefore, a good idea to stay away, or at least keep its consumption to a moderate level if you want healthy, damage-free skin. Next articleHow to Treat Neck Acne? What Kind of Foods can Aggravate Acne?